It's our own fault... Deal with it. TL:DR I delete every cloud service I belong to and take back control of my data. I don't blame them. I just keep thinking about a future scene from the next bond film. M: So you see 007, we need to find out which of the millions of citizens of this county has stollen the 'Space Laser'. 007: That might be tough M, but I'm sure with the aid of an invisible car, a watch that shoots poisonous darts and a couple of scantily clad female Russian agents, I'll be able to find the culprit. M: Yeah, that's one option, but we thought we'd just look on BookFace. M: BookFace, haven't you heard about it. You really are a dinosaur, 007. You see whereas a few years ago we had to run all kinds of covert undercover operations to find out what the residents of the country were doing, now we just need to look on BookFace. 007: You mean they tell us their secrets? Idiots. M: I know. It seems that your average citizen is quite happy to share almost every facet of their lives; every iota of personal information; every thought, deed and desire, all in exchange for the ability to tell their friends and family that they've just had a poo, or show them a cute picture of a cat with a whimsical caption beneath it. 007: So what your saying, M, is that you don't really need me anymore. I'm as guilty as everyone else out there. I talk to family on Facebook, friends on Google+ and colleagues on Twitter. I keep my documents in Dropbox, my notes in Evernote and my photos in Picassa. I keep my contacts in iCloud , my calendar in Gmail, my tasks on Wunderlist and I store my passwords in Lastpass. I even let Apple track my every movement in case I misplace my iPad, and Google track me when I need to know where the nearest McDonalds can be found. I've signed up for a myriad of services, all of them apparently 'free', when in reality I've purchased the services with my personal data. I could be outraged that this data has been accessible (by whatever method) to the NSA in the States and to GCHQ in the UK, but I also have to ask myself who is truly at fault here? By giving these corporations (that are all subject to the laws of the countries they operate in) our data, we have presented too easy an opportunity to the security services. Like a sheet of virgin bubble rap, they just couldn't help themselves. They had to start popping those privacy bubbles. Rather than get angry or upset, I've decided to take action. I'm going to try and quit them all. I'm going to wrestle back control of my data, and ditch the cloud. To some extent the cat is already out of the bag, probably with an odd expression on it's face and a whimsical caption floating beneath it. My data is already out there, but I can try and stop providing them with any more. I'm not going to ween myself off. I'm going Big Bang style. This weekend I'm getting rid of all my online accounts. Facebook - Piece of piss. I've nothing of value stored on Facebook, so deleting my account was not an issue. And I do mean delete and not deactivate. I've made that mistake before and it's just too tempting to pop back on just to see who's had a poo lately or posted a picture of a kitten that looks like it's having a poo. 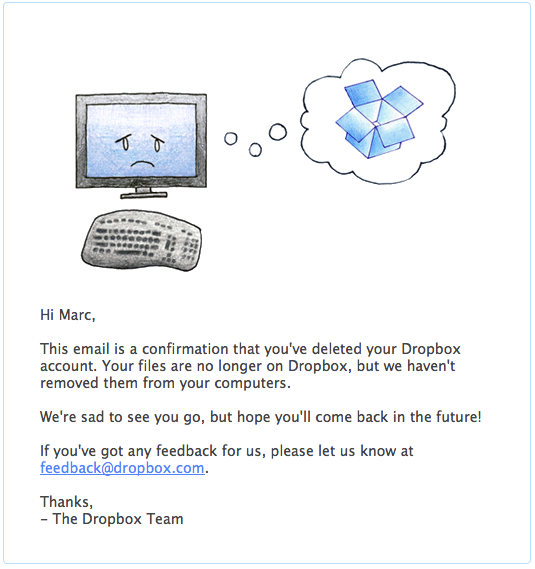 Dropbox - Not so easy. I've carefully nurtured 20Gb of free storage on Dropbox over the years and I'll be sad to see it go. Nevertheless, I've made the commitment to this so it has to be done. First thing to do is find an alternative. BitTorrent Sync looks like it'll do the trick for now, so I've installed it on my Mac Book and Mac Mini and transferred all my files over into my newly created BTSync folder. I then logged into Dropbox on the web and deleted my account. Browser - I use Chrome, and I tend to be logged into my Google account while doing so. I install Firefox and send Chrome to the trash. Search - No more Google search for me. This one is easy enough. I remove the default search tools from Firefox and install the curiously named Duck Duck Go search tool. I also set my privacy settings so I'm always in Private Browsing mode and I don't accept cookies. Browser Addons - Just to help to secure my privacy a little more, I've installed AdBlock Plus and NoScript. Internet - Know I'm no 1337 hacker but I'm pretty sure that if I want privacy online then I'm going to need to hide my IP address at times. I've played with Tor before, but I find it too slow. Additionally I've no use for the Silk Road as my drug of choice is sold in packs of four at supermarkets. Instead I've opted for a VPN. BTGuard seems like a fairly reputable provider so I pay up front for three months worth of VPNing and configure it on my Mac. Microsoft - This one should be easy. I don't use Skype or Windows and my XBox account is separate. The only regret is that as an early adopter of Outlook.com, I'm going to lose some cool email addresses. The problem however, is that when I try and close my account it tells me that I have to cancel my paid services (I don't have any) and as there is nothing to cancel, I'm locked in a vicious circle. 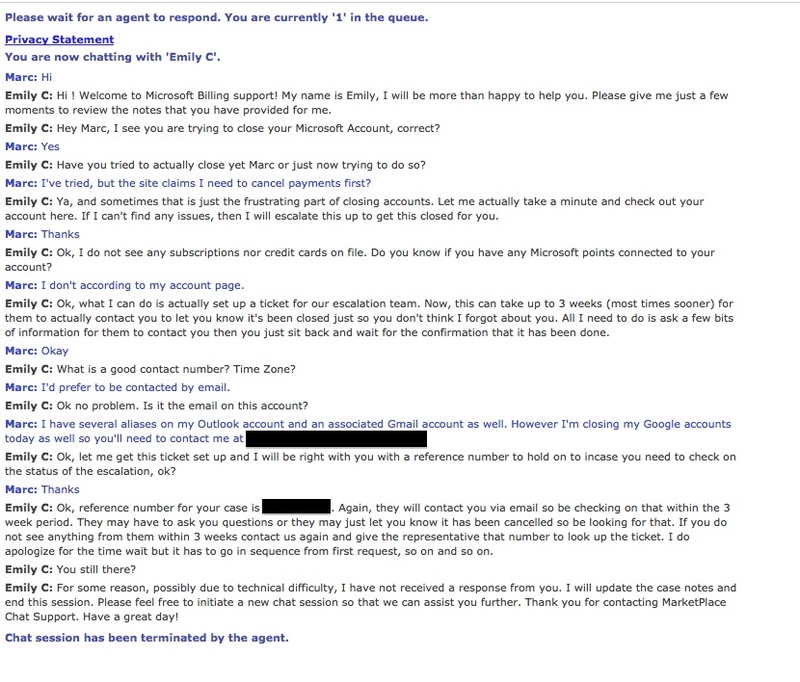 After a nice chat with a Microsoft 'Agent', I'm told they'll get back to me within 3 weeks to close my account. iCloud - This one's a fairly easy. First I need to transfer all my iWorks documents out of iCloud and into my BTSync folder. With that done I switch off iCloud syncing for my calendar, notes, contacts and just keep them all on my Mac. 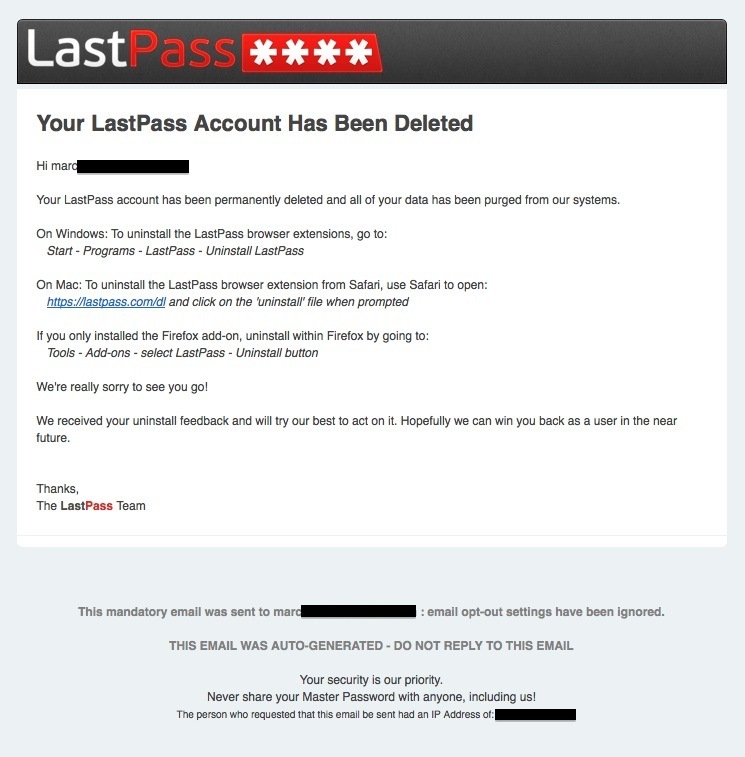 LastPass - I've used this password manager for around a year, and I like it. However, in order to sync passwords across devices it stores them all in the cloud. 1Password seems like a sensible alternative, so I fork out my seventeen odd quid and install it. Transferring my passwords is a simple CSV export and import. Phone - This one is a tricky one. First off let's tackle my phone. It's a Nexus 4, which means it's pretty much reliant on Google services. Luckily, it's a Nexus device so there are alternatives. 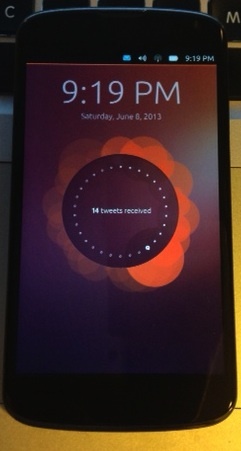 I'm opting for Ubuntu Touch. Now the OS is far from ready, but so long as I've got the ability to send and receive calls and SMS, and I can browse the web, I can wait for the OS to become more fully featured as the months progress and get rid of that fourteen tweets notification. Following the instructions on the Ubuntu website was simple enough as my device was already rooted. I had a small heart attack when it went into an infinite boot cycle, but a quick wipe and a manual install resolved the issues and I have a nice new phone to play with. Google - My main (non-work) email is my Gmail account, but I'm not overly bothered about this. I also use G+ for photos and keeping in touch with people. I decide the most sensible option is to do a Google Takeout and export all my data. My broadband isn't the best however and its taking hours to download the 20Gb of data I have sitting on Google's servers. I have an email within the battle-school domain which will now be my only personal email address. I haven't told anyone about my change of email address but I've made sure all my accounts use the new one. If anyone needs to contact me they can call me (assuming my Ubuntu phone still works). I download GPG for Mac Mail and install it for a little extra security when I want it. There's a little more tidying up to do. I delete my other accounts like Evernote and Wunderlist, resolving to use SublimeText for that kind of thing from now on. So there we have it. I'm free. My data from now on is mine. There are a few more things for me to look into. I'd like to have access to a secure social network - possibly based on P2P technology with end-to-end encryption, but I'll save that for another day. I'm going to carry on using Twitter, as it's all fairly public anyway with no pretense of privacy.